A cow whose tiny stature saved her from the abattoir has entered the record books as the world's smallest. Swallow, a Dexter cow from Cheshire, stands 33.5in (0.8m) tall from hind to foot - shorter than most sheep. The 11-year-old, who is currently pregnant, has produced nine calves and is described by owner Caroline Ryder as the "nanny of the herd". Swallow secured a slot with the tallest dog, longest snake and oldest gorilla in the 2011 Guinness World Records. 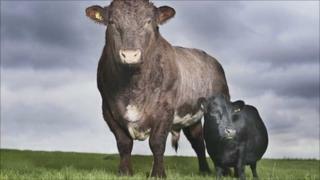 The tiny cow was born in Newbury, Berkshire in 1999 and bought by the Ryder family at a rare breed auction in 2006. Brought up in Rishworth, West Yorkshire, her small size means she is used for breeding, explained Mrs Ryder, who recently moved to Crossley Hall Farm, near Congleton. "She was quite small when she was born and she has grown proportionately," she told the BBC. "She is really sweet - an asset to the herd. For a small cow with short legs she can't half move fast." The family approached Guinness after noticing a posting on a Dexter cattle forum from someone looking for the smallest cow. After putting her name forward last year, Guinness confirmed the record a few months ago. Mrs Ryder's husband, Martyn, said: "I think she is just a genetic anomaly." Craig Glenday, Guinness World Records editor-in-chief, said the tiny cow was one of his personal favourites among the 3,000 new records. "It's been a fantastic year for record breaking," he said. "The animal records are always among the most popular we have in the book." The updated edition of the book, published on Thursday, also records a host of new British record breakers. Stephen Parkes, 44, from Nottingham, gains an entry for owning the largest collection of Smurf memorabilia - a total of 1,061 items. West Midlands resident Stephen Buttler broke the record for the most push-ups with claps in one minute. He completed 73 - or 1.2 push-ups each second. And the record for the Largest Commercially Available English Breakfast went to Mario's Cafe Bar in Bolton, Greater Manchester. For £10.95 customers can tuck into six rashers of bacon, six sausages, four eggs, six slices of bread, five black puddings, mushrooms, a can of beans and tomatoes. But if they manage the meal in under 20 minutes - it is free.